Vantage has adapted its operational strategy in response to the changed economic and market conditions which the gold mining industry has had to contend with since 2011. .
Increasing development to provide greater underground mining flexibility. Optimize the expansion and development from underground at the Lily Mine during 2014 with a view to increasing production to a capacity 35,000 ounces per annum by 2016. 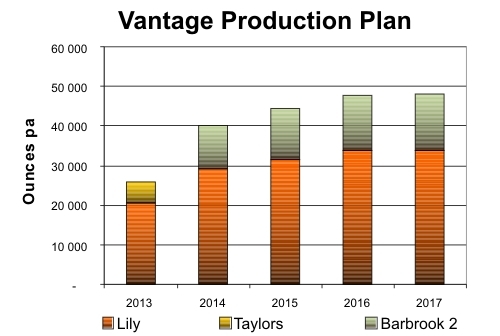 Transition from Stage 1 trial production at the Taylors Mine (which will be completed by 2014) to the Barbrook Stage 2 Expansion by initially producing 15,000 ounces per annum by 2016. Plan to eventually increase to between 50,000 and 60,000 ounces per annum from production from Barbrook, subject to the final results of the Bankable Feasibility Study for the Expansion. Increase the processing capacity of the Central Metallurgical Complex (“CMC”) to accommodate the treatment of both Lily and Barbrook Stage 2 ore at full production to collectively yield more than 90,000 ounces per annum. Continue exploration over the company’s prospecting rights with the objective of discovering sufficient mineral resources to justify establishing separate mining and processing nodes.